You are here: Home / Blog / Why Use a Hover Mower? Why Use a Hover Mower? Wondering what the best choice of mower is for your garden? Maybe your neighbour has got a shiny orange plastic beast that hums over the lawn, and you’re feeling the need to compete. Here’s a quick overview of what exactly a hover mower is, and why you might consider using one for mowing your lawn. Hover mowers are just rotary mowers that float on a cushion of air instead of resting on wheels. The mechanism is similar to a hovercraft, using an impeller above the blades to push air downwards and cause the mower to rise above the ground, making them easy to manoeuvre, and generally lightweight as they need to float on air. Why Should You Use a Hover Mower? 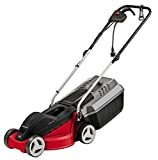 If you want to buy a small mower (usually) that is well suited to small lawns and those hard-to-reach under the apple tree pockets of grass. Bigger models are also available but not so many. If you want to be able to swing your mower around in all directions, not just forwards and backwards. This makes hover mowers perfect for navigating lawns with complex shapes. If you don’t care too much about the finer details of the cutting mechanism, or having perfectly cut blades of grass, but just want a cheap and easy solution. If you want a mower that you can use on steep slopes, water edges, and rough and weeded areas, or sanded areas. Hover mowers are often used on golf courses and for commercial landscaping. Want a mower than can be easily stored in a shed or garage. Hover mowers tend to have folding handles, making them easier to hang on a wall for efficient storage. Why Shouldn’t You Use a Hover Mower? If you want a mower with a grass collection bag. Some hover mowers have grass collection bags, like the Qualcast Hover Collect, but most don’t, and they often don’t work as well as they could. If you want a mower that you can wheel around. Sure, some mowers come with wheels that can be used to drag it for a short distance. But the lack of wheels on some hover mowers can mean that they have to be carried from the place of storage to the lawn, which can be tiresome – but bear in mind hover mowers float on air and by nature have to weigh very little so are usually easy to carry. If you want a mower that will give you a perfect cut – because the grass is pushed away from the blade by the air, they can sometimes result in an inferior cut. If you want stripes, or a perfect bowling green cut, then you are best off avoiding hover mowers. 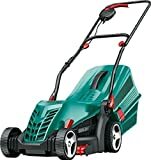 Which Hover Mower Should I Buy? There are two main types of hover mower – electric and petrol. Petrol models are rare, and tend to be alot heavier, with more power, and more suited to larger lawns. Electric models on the other hand, while suffering from a cumbersome electric leads, are also lightweight and easy to use. This makes them perfectly suited to small lawns with nearby plug sockets. One of the most important factors for most people buying a hover mower is ease of use – the hover mower should be simple to operate and move around. This means it should be light, so check you are comfortable with the weight if you will have to carry it for any distance, and also comfortable to use – so check the check the height of the handle and make sure it is comfortable to work with. For more information, see my full Hover Mower Buying Guide.